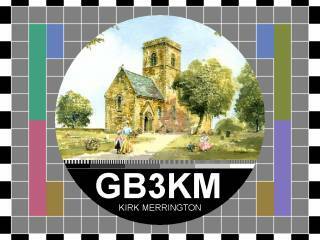 The new kid on the block; GB3KM is the region's only Amateur TV repeater, running on 13cm. Not only this, but it is also features dual-input. It is ran by Terry G1LPS and has been on the air since 2nd October 2004. An internet video stream of the repeater is also kindly provided by Robert M0DTS when he's in the shack. More info below & on the website, take a look! Terry's initial "cunning" plan ... "is to have two user input frequencies and an additional shack camera input allowing a total of 3 persons to be on the same screen at the same time via a real time colour quad processor. Stations accessing the repeater will transmit their inter-carrier sound on 6Mhz and be able to control the repeater using a second sound carrier on 6.5Mhz with CTCSS tones. If only 1 user is on the input their re-transmitted picture will be full screen. If a second user accesses the second receiver input the transmitted screen will be split into 4 quadrants. The display will show the two users in opposite corners with the remaining two corners showing a test card and an information page respectively. Should the Sysop namely G1LPS wish to join in via the shack camera the information page will disappear being replaced by the shack camera image. Leaving a test card and 3 users on the screen to chat away. The test card could in the future be replaced with another receive input on 13cms or another band as licensing permits."